Opening Emerging Gateways Pacific Rim Summit Hosted By REALOGICS Sotheby's At Kirkland showroom. 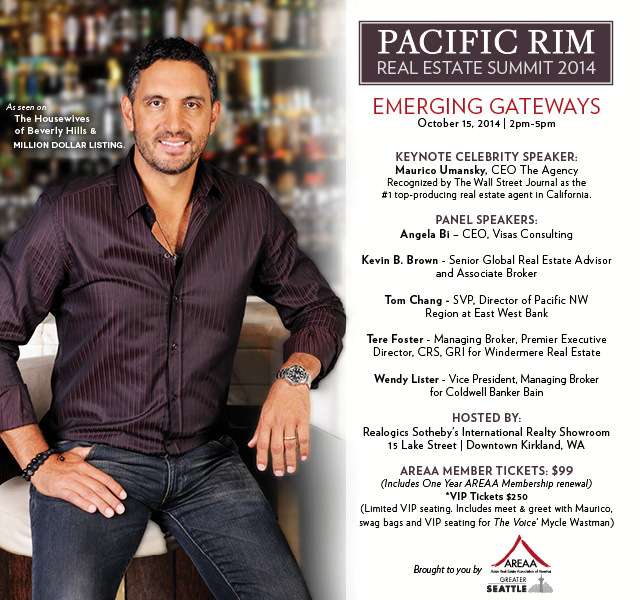 On October 15, 2014, the 1st Annual Global Pacific Rim Real Estate Summit, sponsored by AREAA and hosted by Realogics Sotheby’s International Realty at the Connoisseurs of Life Showroom, will take place. Learn best practices for working with international buyers, build your understanding of global investment strategies, and learn from experts whose experience will grow your business with investors in Asia and around the world. A-List real estate and luxury brand experts will provide education and entertainment in an intimate setting. This summit will include the current state of global housing markets and insider secrets on how to develop business relationships with international clients, including advice from our Tax Attorney and EB5 specialist. We’ll have a panel of influential speakers on international trends and we’ll be greeted by the one-and-only Mauricio Umansky, CEO of The Agency in LA. Mauricio will provide us with a keynote address about the emergence of global markets and inspire us all to break free of the status quo, in this case, targeting Asian homebuyers. Q&A and sponsor presentations, we’ll be joined by a former VOICE contestant for wine and music and then retire at Maison DeLille. The event also offers attendee’s unparalleled business networking opportunities at the international reception and an unforgettable evening with our After Glow VIP Mixer. $50 General Admission – Admission to the Summit, wine, and appetizers. $99 General Admission + AREAA Membership – Become an AREAA member or re-new your AREAA annual membership ($150 value). Admission to the Summit, wine, and appetizers. $250 VIP (30 tickets available) – VIP admission, annual membership, front row seating, drinks, appetizers. After Glow Party to meet Mauricio Umansky, panelists and special guests from across the world. Photo taken with Mauricio Umansky, Mycle Westman private concert, VIP swag bag and DeLille wine.